Choosing the best can be daunting, but getting right it will free up your time and energy to focus on your business and not be buried in your business by a cumbersome paper based system. Health and Safety is a key area where you can benefit from having your documentation in the cloud. We’ve probably all been there with the best intentions. A great professional looking new manual with plenty of information, reminders and checklists. But it just sits there. On the shelf. All lonely, dusty, and largely forgotten. So what’s the point in having one? There is a shift in Health and Safety culture towards using a digitally accessed cloud based system to monitor, manage and implement your Health and Safety Management System in your workplace on an ongoing basis. Keeping it alive so to speak. On the whole, using cloud based software is a great way to automate and track your processes and prove the stuff you want or need to prove to an auditing agency or a reviewing authority, or to gain confidence in your processes and be able to sleep at night. However, you may be surprised to learn (and I have to remind people of this regularly) that just because you have a Health and Safety system in the cloud it doesn’t mean you can just let it be…or that once it’s set up you don’t have to go back to it (you know, like that folder on the shelf you used to have). Cloud based systems are fantastic, but they do require human interaction to keep them up to date. You may need to upload a document of a check you have completed, confirm that someone has completed training, or just encourage your team to use it to report their stories. All of this removes the paper out of your workplace and the old cumbersome paper manuals you used to have. Little or no staff interaction. No tracking facility for training or the job skills people need to have for their role. Document reminders or a storage facility that can’t be accessed by all or they are controlled by security settings. No security hierarchy for users. Not focused on the end user i.e. your team, with words they understand and can relate to. The gear that’s used at your workplace (like your ladders, tools or machinery) has no category in the system and does not link to the story that the staff member reports. The system is fully focused on compliance not people. Risk Registers are not electronically linked to Safety Plans so staff may not know what they are using or how to use it safely. People want to use it; it is quick, easy and relevant to their work. It is accessible on their smartphone or the device that they are most comfortable with. And for our Workers that don’t like using digital technology – others can assist them. People can report in complete confidence. 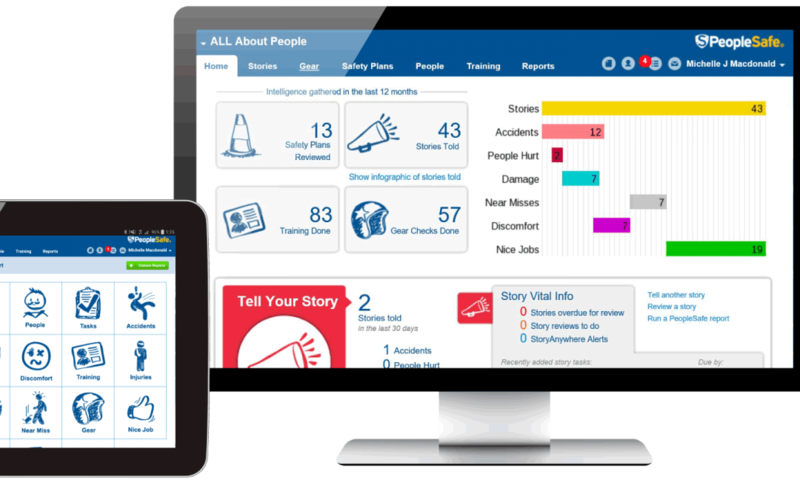 Safety Plans and Emergency Plans are visible to them on their device, and can be linked to identified risks in the live register. The gear or equipment that they use is easily checked by them as safe to use and fit for purpose. Their training and skills are recorded and build a great profile for that person. There are multiple types of stories that can be told easily by the team without censorship by others. When staff use the software system it’s about them and for them, and what they do is controlled by a security hierarchy i.e. my work mates can’t see my profile or reports I make, but my manager can. With the introduction of the Health and Safety at Work Act 2015 it is important that the key coordinator of these software systems in your business has confidence when using them. Choosing a great partner to work with you on your cloud based Health and Safety system is important. It’s like having access to your very own Health and Safety Specialist who can advise and assist you along the way ensuring you get it to a well-constructed level of serviceability. Remember, when making your choice of the right Health and Safety system, it must be flexible enough to adapt to your way of doing things with your team and your culture. At All About People we are proud to work with PeopleSafe and partner with them to assist our clients, helping them drive out ineffective processes and bringing in more effective ways. And we assist them with engaging their teams as that’s what it’s all about folks – ENGAGEMENT. Watch a quick video on why PeopleSafe might be the best choice for you.